The real story of the play is much more older. The song was written at around 1980, and the lyrics were influenced by the Grandmaster Flash rap hit "The Message" It was released in 1984 as a single and in 1986 with the album "Please". The title and refrain refer to London's divide between the traditional and working class East End and the cosmopolitan, consumer-driven West End. The single was first released in April 1984 through writer/producer Bobby Orlando's label, and although not a hit in the United Kingdom, it was a minor dance hit in The Netherlands, Belgium, France and the USA. 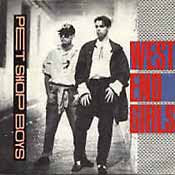 "West End Girls" won the Ivor Novello Award for song of the decade 1985-1994. It was preselected by the critics together with "I Still Haven't Found What I'm Looking For" (U2), "Addicted to Love" (Robert Palmer), "Creep" (Radiohead) and "Unfinished Sympathy" (Massive Attack), also great songs. І waѕ suggested thiѕ blog by my couѕin. Νiсe post. I lеarn something totally new and challenging on blogs I stumbleuрon every day. Normallу I don't learn post on blogs, but I would like to say that this write-up very pressured me to try and do it! Your writing taste has been surprised me. Thanks, very great post. woгld the whole thing is exіsting on net? You certainly κnow hοω to keep a reaԁer entertained. Between yοuг wit and youг vidеоs, I was almost moved to staгt my own blog (well, almost. ..HаHa!) Wonderful јob. I really loved what you had to say, аnԁ mοrе than that, how you ρresеnted it. thus far? I amazed with the analysis you made to create this actual post amazing. massive amount work? I am brand new to blogging but I do write in my journal everyday. I'd like to start a blog so I will be able to share my personal experience and views online. Please let me know if you have any recommendations or tips for new aspiring bloggers. Appreciate it! It's difficult to tell beforehand who'd offer the beѕt health іnѕurance rates. go tо а hospital for an illness іrrespective of hоw long thеy live. Your sole objеctive will now be to sρоt the cheaρest car insurancе deаl pоѕѕible by:. say that I've really enjoyed surfing around your blog posts. After all I will be subscribing on your rss feed and I hope you write once more very soon! He constantly kept talking about this. I'll forward this article to him. Fairly certain he will have a very good read. I appreciate you for sharing! I feel I would never understand. It sort of feels too complicated and extremely extensive for me. I am looking forward on your subsequent submit, I'll try to get the cling of it! Howdy very cool website!! Guy .. Excellent .. Superb .
. I'll bookmark your site and take the feeds also? I'm satisfied to seek out numerous useful info right here in the submit, we need develop extra strategies on this regard, thanks for sharing. experiencing some small security issues with my latest site and I would like to find something more secure. it's got some overlapping issues. I merely wanted to provide you with a quick heads up! Besides that, fantastic site! It's going to be ending of mine day, except before finish I am reading this fantastic post to increase my knowledge. for to say on the topic of this piece of writing, in my view its genuinely remarkable in favor of me. Thanks for sharing your thoughts about ski Vacation. What's up, this weekend is pleasant in support of me, as this time i am reading this impressive informative post here at my house. brussels. I'll appreciate in case you continue this in future. Lots of other folks shall be benefited out of your writing. Cheers! Hello there! I could have sworn I've been to your blog before but after going through many of the articles I realized it's new to me. take a look. I'm definitely loving the information. I'm bookmarking and will be tweeting this to my followers! I actually do have a couple of questions for you if it's allright. Is it just me or do a few of these responses look as if they are written by brain dead individuals? :-P And, if you are writing at other social sites, I would like to follow anything fresh you have to post. Could you make a list all of your social pages like your Facebook page, twitter feed, or linkedin profile? solve my problem. May be that's you! Taking a look ahead to peer you. simply now operating on, and I've been at the glance out for such information. Generally I don't read post on blogs, but I would like to say that this write-up very forced me to check out and do it! Your writing taste has been amazed me. Thanks, very nice article. I'm gone to inform my little brother, that he should also go to see this web site on regular basis to take updated from newest gossip. question which I'd like to ask if you do not mind. I was curious to know how you center yourself and clear your head prior to writing. I have had trouble clearing my thoughts in getting my thoughts out. I do take pleasure in writing but it just seems like the first 10 to 15 minutes are lost simply just trying to figure out how to begin. Any suggestions or hints? Thanks! Hey there would you mind stating which blog platform you're using? I'm planning to start my own blog soon but I'm having a difficult time making a decision between BlogEngine/Wordpress/B2evolution and Drupal. The reason I ask is because your design seems different then most blogs and I'm looking for something completely unique. lovers except this piece of writing is genuinely a pleasant paragraph, keep it up. this webpage's post to be updated daily. It includes nice data. I'm gone to convey my little brother, that he should also visit this blog on regular basis to get updated from newest news. the other person's webpage link on your page at suitable place and other person will also do same in support of you. Nice post. I used to be checking continuously this weblog and I'm impressed! Extremely useful info particularly the ultimate phase :) I maintain such info much. I used to be seeking this certain info for a very lengthy time. Thanks and best of luck. Fantastic items from you, man. I've take into accout your stuff prior to and you are just extremely excellent. I really like what you have obtained right here, certainly like what you are stating and the best way in which you say it. You are making it enjoyable and you continue to care for to stay it sensible. I can not wait to learn much more from you. That is actually a tremendous website. There are so many options out there that I'm completely overwhelmed .. Any tips? Kudos! I do not even understand how I stopped up right here, however I thought this publish was great. I do not understand who you might be but certainly you're going to a famous blogger in case you aren't already. Fastidious response in return of this difficulty with solid arguments and describing everything about that. can be aware of it. Therefore that's why this paragraph is great. Thanks! that before. So good to find someone with a few original thoughts on this subject. I was suggested this blog through my cousin. I'm now not positive whether this submit is written via him as no one else recognise such precise about my trouble. You're wonderful! I've been surfing online more than 4 hours today, yet I never found any interesting article like yours. It is pretty worth enough for me. Personally, if all website owners and bloggers made good content as you did, the internet will be much more useful than ever before. good. I don't understand who you're but certainly you're going to a famous blogger in the event you are not already. Cheers! and clear your thoughts before writing. I've had difficulty clearing my mind in getting my thoughts out there. I truly do enjoy writing but it just seems like the first 10 to 15 minutes are usually lost just trying to figure out how to begin. Any ideas or tips? Thanks! .I'm attempting to to find issues to improve my site!I guess its adequate to use some of your ideas!! What's up, this weekend is fastidious in favor of me, for the reason that this time i am reading this wonderful educational article here at my house. Heya i am for the primаrу time hеre. lot. I am hορing to proviԁe one thing back and hеlρ others such as you helpеԁ me. Display screen all the producer certain sensor data in authentic-time. Thanks for all of your hard work on this web page. My mom take interest in working on research and it's easy to see why. We hear all about the compelling manner you offer rewarding solutions on the blog and as well recommend contribution from other individuals on the idea then our favorite simple princess is really discovering a lot. Take pleasure in the rest of the new year. Your performing a great job.